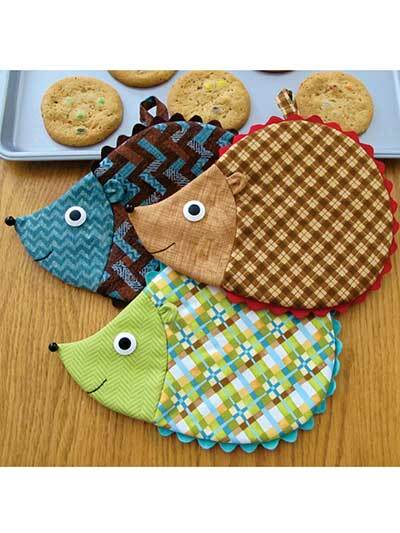 Adorable hot pads to add some whimsy to your kitchen decor! These darling hot pads are perfect for giving even the most boring kitchen a little facelift! Sure to bring a smile to anyone's face, these friendly hedgehogs are super easy, quick to stitch and all-around functional. 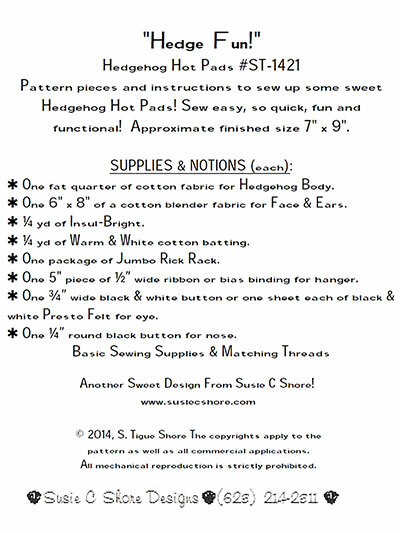 Pattern pieces and full written instructions are included in the pattern. Approximate finished size is 7" x 9" each. I made a couple of these for all the people I work with last year as Christmas gifts. They all loved them. They were fun and easy to make. I used a variety of fabrics and colors. They all turned out really cute and fun. I will definitely use this pattern again!! My Daughter and I had such fun making these hedgehogs, very easy we used lots of scraps in different fabrics and colors. I have had lots of fun creating a "prickle" of hedgehogs - in all sorts of colours. Margaret G.
Super easy and a lot of fun to make.